To celebrate Chandra’s 15th anniversary, NASA has released four new images of supernova remnants – the Crab Nebula, Tycho, G292.0+1.8, and 3C58. Fifteen years ago, NASA’s Chandra X-ray Observatory was launched into space aboard the Space Shuttle Columbia. Since its deployment on July 23, 1999, Chandra has helped revolutionize our understanding of the universe through its unrivaled X-ray vision. To celebrate Chandra’s 15th anniversary, four new images of supernova remnants – the Crab Nebula, Tycho, G292.0+1.8, and 3C58 – are being released. 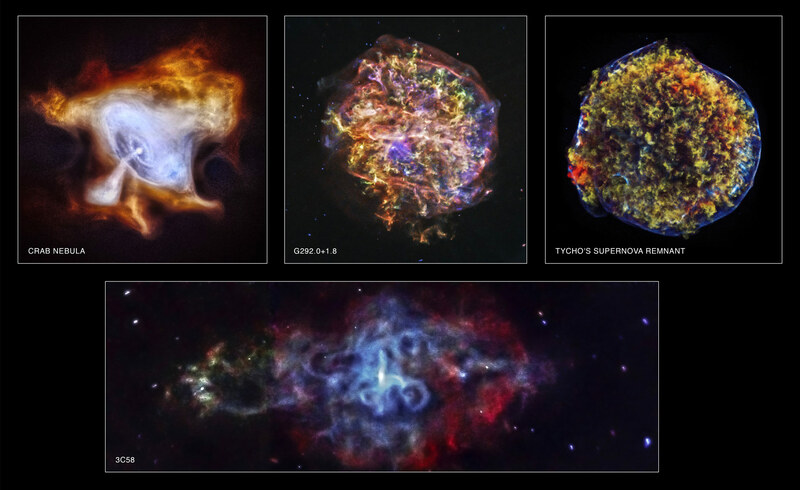 These supernova remnants are very hot and energetic and glow brightly in X-ray light, which allows Chandra to capture them in exquisite detail. Chandra orbits far above Earth’s X-ray absorbing atmosphere at an altitude up to 139,000 km (86,500 mi), allowing for long observations unobscured by Earth’s shadow. When it was carried into space in 1999, it was the largest satellite ever launched by the shuttle. Originally called the Advanced X-ray Astrophysics Facility (AXAF), the telescope was first proposed to NASA in 1976. Prior to its launch aboard the shuttle, the observatory was renamed in honor of the late Indian-American Nobel laureate, Subrahmanyan Chandrasekhar. Known to the world as Chandra (which means “moon” or “luminous” in Sanskrit), he was widely regarded as one of the foremost astrophysicists of the 20th century. 1 Comment on "NASA Releases Four New Images to Celebrate Chandra’s 15th Anniversary"
The look like single cell organisms.